I have completed the first week of my 28 day reboot and things are going really well. I have successfully added activity to my daily life and I've been reminded that I find both walking and biking really fun. My walking goals are also having a positive impact on my behaviour. On the weekend I was laying in the backyard reading, and at the end of each chapter I got up and walked around the house for about 5 minutes (about 500 steps). I'm really starting to be conscious of being more active and I love adding little pockets of walking to my day. 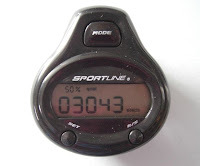 I am tracking my walking using a pedometer and it has become a great little motivator for me. I have daily step goals and it is a great gauge of how much more activity I need to do before the day is done. One of the most important things about wearing a pedometer is remembering to put the damn thing on. I often forget to attach it to my belt right when I wake up and when I get out of the shower. Too many times this week I found myself puttering around the house for a few hours before I realized I wasn't wearing it. Over the past week I also realized that my pedometer makes a jingling sound. Jingling means it's working. No jingling means steps aren't being counted. A frustrating fact I discovered after a nice long walk around the grocery store, making sure to hit every aisle, to get my steps up. It turns out the pedometer needs to be strait up and down to work, so the waistbands of certain pants are too thin to keep it oriented properly. I've figured that out, but now I'm that person at the grocery store who keeps looking at her waist to make sure the pedometer is working. The thing I am trying to remember is that regardless of whether my pedometer is counting as it should be, I am indeed walking more. That's what really counts (groan! ), right? I totally agree that it's the walking that counts. I know we can get stuck on numbers and charts BUT you are doing this daily and that is fantastic. I still can't walk yet but it's getting closer. And I miss it so much, so for now, I'm living through your activity. I might be on the sidelines but just a wee bit longer. PS: Going out to eat again with family tonight (I think anyway), and with all the high-salt, my gosh it's hard to find good stuff. Trying a new place I think, otherwise I'll just go with the baked potato and lettuce bowl again. Things got switched and we did lunch. So I drank about 900ml of my stuff at home, then had a small side of slaw and unsalted corn. Wasn't that bad, really. I stayed at 170 in salt. Well that sounds like it worked better. I know when I started meal planning and eating at home I found myself declining dinners with friends, or just being the person who ordered a small side while everyone had dinner. Most times I had already eaten at home, but still wanted to be social. Yeah, that was me before getting sick. I was the VegHead who ate hardly anything out. Or, like you mentioned, just got a little side salad. I was sooooo picky back then. What I did more was have my girlfriends over for meals. Oh I was checking out the fitbit website the other day trying to see how all that worked. I don't mind paying more for something if it works, and this looks like it has all the bells and whistles. I got my pedometer for less than $10 and you can tell. Thanks for letting me know you have one, I'm really thinking about getting one.